Becoming a hydraulic specialist opens the doors to a range of job opportunities that offer solid incomes and excellent job prospects. Within the requirements of the job, you will need to have a thorough understanding of hydraulic systems, analyze load and motion by performing calculations for the work profile, and generally ensure that the entire system is kept clean and working smoothly. Most areas of hydraulic engineering require calculations, and your understanding of math needs to be strong in order to solve all the problems that will appear in the exam. You will need to learn how to calculate heat loss and how factors such as force, torque, velocity, and power affect the system, all of which will be needed for analysis and troubleshooting problems. You should also study ladder logic and basic circuit calculations. Study material will be provided for the exam which you must study from, and the topics will include load and motion analysis, system troubleshooting, fluid conduction and filtration, control components as well as system design. Buy or rent all the books that are mentioned in the syllabus, as well as any reference books or guides recommended by the teachers. 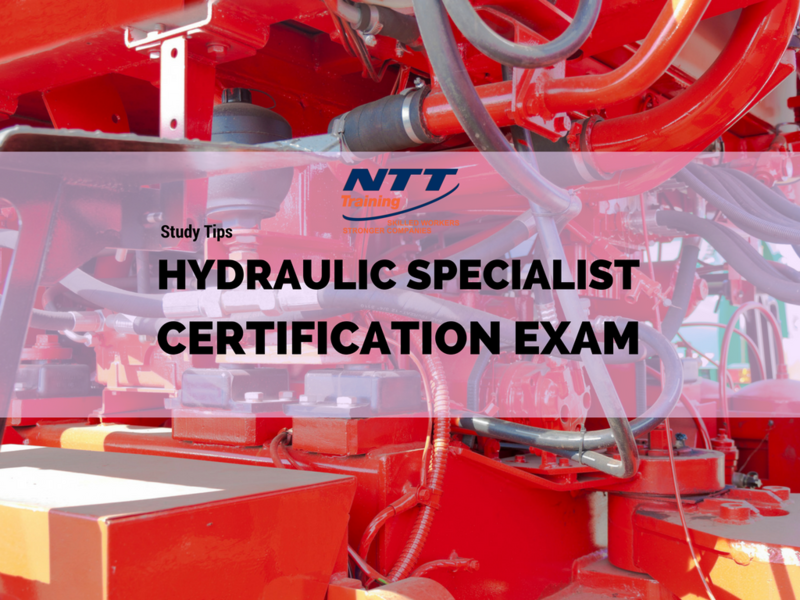 There are notes available online on every subject in hydraulics that are virtually free, and can be of invaluable aid in preparing for the exams. If reading through the whole book proves to be too much of a challenge, mark out the important areas and the ones you feel confident in. You are taking the exam to prove your level of competency with regard to a real world job, and as such, theory will only take you so far. You will have to get practical, hands-on training in terms of maintenance and upkeep of hydraulic systems. Among other things, you will have to learn how to handle the electric control system and identify fluid properties, and their compatibility with seal materials. ISO levels of cleanliness must be observed for each of the systems. This is one of the many safety features and procedures that must be remembered and will be asked about during the exam. You will need to be aware of the problems that are normally encountered while setting up the hydraulic systems, and how to handle them. You also need to know about bio-degradable fuels and their uses within the system in a safe manner. Studying for the exam need not be a lonely exercise. Our brains are stimulated by the exchange of ideas with others, and forming a group can be a great way to get in touch with fellow aspirants who can help you learn. Group learning allows you to discuss the study material, and ask for help on the subjects that are causing problems. You can exchange notes and other information related to the exam, and study in an informal, classroom type atmosphere that encourages learning. It is possible that you will not qualify for the exam on the first try, for a number of reasons. But this does not mean the path to becoming a hydraulic specialist is lost to you forever. You can take the test again next year. But before doing that, you can ask for your performance report on the exam. Make a careful study of your performance, and try to determine which areas of study are your strengths and which are causing you trouble. This will provide you with a clear idea of what you need to work on to do better during the next exam. If you’d like more information about any of our fluid power hydraulic certification exam, or you’re ready for the training to get you there, Contact NTT Training today!